With all the favorites like fresh fruits, chocolates and cheeses, its a classic example of just how great a basket can be. 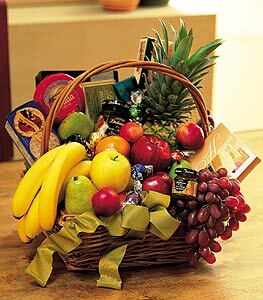 Apples, bananas and pears, along with cheeses, chocolates and crackers, arrive in a wicker basket with handle, tied with a bow. Note: Same day delivery for this item may not be available in all areas. I was extremely impressed with the professional service and delivery. The bouquet looks amazing!! Thanks!